New draper head designed to match the high capacity to match the CR Series Twin Rotor and CX8000 Series. The draper heads will provide closer cutting and better floation. New Holland has introduced a new SuperFlex draper head specifically designed to match the high capacity of New Holland CR Series Twin Rotor and CX8000 Series Super-Conventional combines. 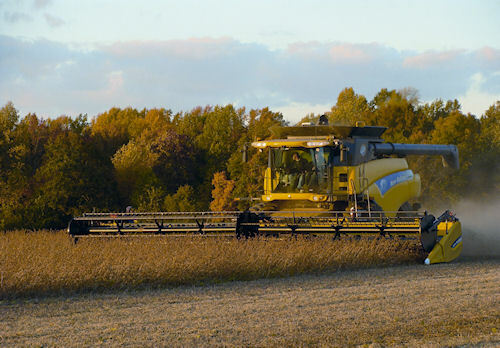 "Header designs play an important role in reducing harvesting losses," says New Holland Cash Crop Marketing Manager Ed Barry. "The new 880CF SuperFlex draper head provides closer cutting and better flotation so farmers can harvest every bit of their valuable crop." A patented, rubber spring flotation system allows the 880CF head to follow ground contours more closely. The rubber torsion springs on each floor support can be adjusted manually to tailor flotation to conditions or to compensate for any cutterbar unevenness. The six-bat reel smoothly feeds crop to the cutterbar, which cuts cleanly using three-inch guards and overserrated knife sections with 10 teeth per inch. Reel sensors provide for easy return-to-cut after each pass. A shorter skid shoe design reduces weight and allows the cutterbar to cut closer to the ground for better cutterbar flexing. The hydraulic center knife drive system uses a patented single gearbox mounted under the center draper to drive both knife assemblies. This unique and patented design distributes weight evenly, neutralizes header vibration and leads to exceptionally smooth cutting action. Variable-speed outer draper belts and fixed-speed twin 41.6-inch center draper belts deliver the crop smoothly to the floating 26-inch-diameter auger. The auger features five-inch flighting and handles heavy crop and feeds it smoothly into the combine. A flatter auger floor angle aids crop flow. The auger can be adjusted up, down, fore and aft to match conditions and a new, patented rubber retention system prevents broken auger fingers from entering the combine.